Is there already a thread devoted to agnostic and/or slightly more woo synchronistic speculation about all this? I have no clue what is going on and am the first to admit it. If I'm missing the obvious big picture view, I'm really curious to hear more about it. The data dumps are a fantastic resource but the only thread that I am aware of which is somewhat meta is still allied with the opinion that more or less the entirety of Russian involvement in our current miasma is a useful fiction. Pundits not name here blaming Putin for yesterday's self-radicalized idiocratic terror event seems to signal a rhetorical escalation, IMHO. So I thought I'd at least start a meta-thread, if knowing full well it may end up buried deep here. FWIW my Afghani Uber driver yesterday (20 year ago ago refugee) talked about the Taliban solely in terms of Soviet/Russian vs US proxy war. He believes Russia was behind 9/11. Meh. But rhetorically and otherwise, I was interested to recall that the initial military response that day had purportedly been to go to nuclear footing as the scenario closely matched what US military had expected in the event of iminent nuclear strike by Russia. Is that perhaps a plausible endgame? ISIS dirty bomb in the midwest is blamed on Russia leads to nuclear strike? I think it would be great if we could discuss this without the "Russian Hacking" angle. It seems to me that would be a good way to start since at this point no one can produce concrete evidence that the Russians were behind the actual hack, maybe yes maybe no...maybe it was inserted into the whole thing for some unknown reason but the evidence of trump and crew involvement with Russian oligarchs/mobsters conspiracy is overwhelming and I would like to stick to that aspect of it if possible. seemslikeadream » Thu Mar 23, 2017 4:38 pm wrote: I think it would be great if we could discuss this without the "Russian Hacking" angle. It seems to me that would be a good way to start since at this point no one can produce concrete evidence that the Russians were behind the actual hack, maybe yes maybe no...maybe it was inserted into the whole thing for some unknown reason but the evidence of trump and crew involvement with Russian oligarchs/mobsters conspiracy is overwhelming and I would like to stick to that aspect of it if possible. It seems overwhelming to the point that it must have been pretty much common knowledge to the Clinton network throughout the election, no? Is there any evidence that whatever arms of the PTB that remain largely out of view gamed the events now unfolding? And to what end? What good is served for who by president Mike Pence, among other things? I think the most useful analysis is rooted in a broadly anti-imperialist "Fight the Power" perspective. This suggests a deep critique of the U.S., NATO, the Israeli State and those most closely aligned with this power bloc but also the governments of Russia, Iran, Syria etc. as representing competing elites far, far more than the working class Multitude. In other words: war crimes are still war crimes, covert operations are still covert operations, reactionary agenda are still reactionary agenda. Democrats vs. Republicans, U.S. vs. Russia, whatever else- it's time to expand our map but keep ourselves grounded in good principles and practices. Russia hacked the election. That right there is the narrative. Yes, It's clear that Russian businessmen and Russian banks and companies have dealings with Trump or his associates. But ditto for America, China, Germany, Ukraine, and a handful of other countries. The connection is Trump, money, and corruption. Without the lurid hacking angle then its just another tale of Trump getting his hands dirty. The 'hacking' is where it all started and is absolutely central to any meta analysis. Shortly before the hacking story coalesced, there were limited media "events" (in unreliable news media mostly) suggesting that Putin was about to reveal 9/11 was an inside job info and claiming that HRC's fainting episode (at 9/11 memorial event) was a Russian operation. the "mad oracles" helming the Russia hysteria are people like Louse Mensch and John Schindler - are we really supposed to believe there isn't an esoteric message there? If anything Russia's image is being rehabilitated in the West by the use of those sorts of figures. Last edited by tapitsbo on Thu Mar 23, 2017 12:46 pm, edited 2 times in total. When President-elect Donald Trump selected Rex Tillerson to be his secretary of state, he consulted members of the Republican Party elite who have done business with ExxonMobil in the past. Last edited by seemslikeadream on Thu Mar 23, 2017 12:40 pm, edited 1 time in total. Does anyone have any indication how much the average non-political U.S. citizen conflates "her emails" from the server headlines going back to 2015 with the Podesta phishing leak? "But her emails!" has been both a serious rallying cry and a joke for almost two years now and I'm never sure what people mean or know when they use it. American Dream » 23 Mar 2017 16:04 wrote: I think the most useful analysis is rooted in a broadly anti-imperialist "Fight the Power" perspective. This suggests a deep critique of the U.S., NATO, the Israeli State and those most closely aligned with this power bloc but also the governments of Russia, Iran, Syria etc. as representing competing elites far, far more than the working class Multitude. Yes, "blowback" definitely happens and to effectively understand it you definitely need an analysis of autonomous social forces but not in isolation. There are generally powerful institutional forces that frame the various theaters of social struggle. it has been and always will be about O. I. L.
liminalOyster wrote: Is there already a thread devoted to agnostic and/or slightly more woo synchronistic speculation about all this? I have no clue what is going on and am the first to admit it. If I'm missing the obvious big picture view, I'm really curious to hear more about it. I don't know if you are speaking of/familar with this thread started in July 2016, which was the origin of the "great divide" in RI opinion on Russian Conspiracy in US? As you can tell from the thread title some people on boarded with a certain bias. The wrinkle with anything shortly before that Mason-Dixon line of a thread is that (pre-Trump reign) in threads it is just assumed Russia is a meddlin, hackin, false-flaggin and a wackin, like any other zero sum super power and so there is no real mewling obstructionism to discussing or laying that out. So most threads before that discussing Russia or Putin are much more agnostic, or more seasoned and reasoned about not demonizing Russia/Putin but not seeing it through rose colored glasses either. But to bring any of that activity from the last 30 years up now, strangely, magically, gets associated with the McCarthy era in the 1950's, 60 years ago. Or raises the specter of being in league with Hillary of the Thrill, Kill, Cult a.k.a. 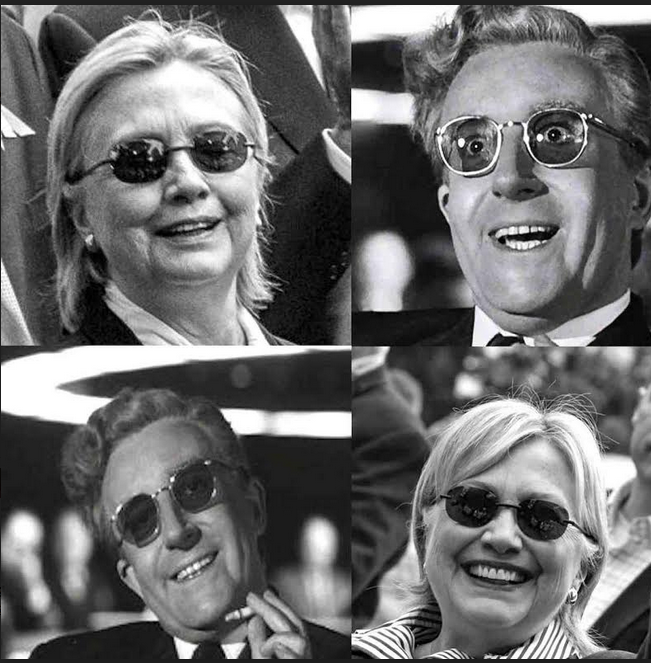 Dr. Strangelove.